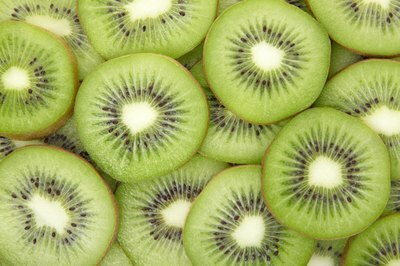 Kiwifruit belong to the genus Actinidia. Earlier known as the Chinese gooseberry, these woody, perennial vines or creepers originated in China. According to the Ohio State University Extension Office, pollination requires one male plant for every eight female plants. Kiwifruit plants are part of the dioecious population with separate male and female plants. "Dioceious" refers to the Greek word for “two households.” Male plants produce pollen, but no seeds. Female plants produce ovules or seeds, but no pollen. Pollination requires both female and male kiwi plants to set the fruit of the female plants. 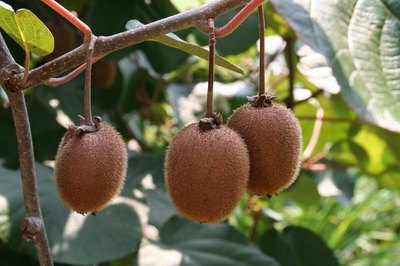 Male or androecious kiwi plants have a reproductive organ that includes a stalk or filament, an anther and pollen sacs. 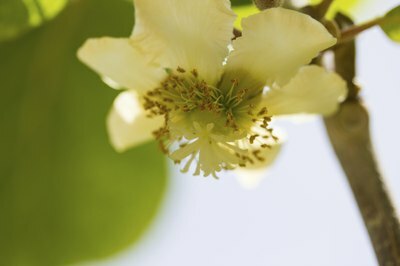 The pollen can spread by air or bees to the receptive female kiwi plant. Males lack the stigma of the female plants, or have undeveloped stigmas. Female or gynoecious kiwi plants contain a tube-shaped style that consists of the ovary, a pollen tube and a stigma. A stigma is the tip that collects pollen during pollination. Because male plants do not produce fruit, they can grow vigorously. After flowering, male plants need pruning. During dormancy, no pruning is required for maximum flowering. For pollination, males and females can stand a maximum of 35 feet apart. 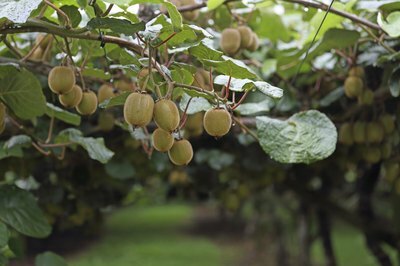 Following pollination, the female kiwifruit tree bears fruit that grows rapidly to full size by mid-summer. University of California: Eaten a Kiwi Lately? 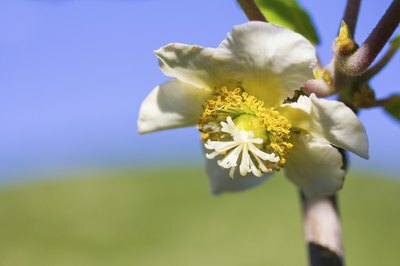 Do Peach Trees Need a Pollinator?